MyLab™ is the teaching and learning platform that empowers you to reach every student. By combining trusted author content with digital tools and a flexible platform, MyLab personalizes the learning experience and improves results for each student. MyLab Education helps learners understand the basic vocabulary of educational research, acquire hands-on experience, and get guided practice in understanding research articles and in conducting and reporting their own research. Learn more about MyLab Education. NEW: Broadened examples beyond teacher education reflect the increasingly diverse disciplines and subdisciplines in educational research. The authors include examples of educational research in fields such as program evaluation, multicultural research, counseling, school psychology, learning and cognition, nutrition, sports psychology, education in the professions, and other fields. UPDATED: An expanded emphasize on technology [e.g., the use of online programs for a table of random numbers, use of online surveys, various databases available (like Google scholar or Web of Science), reference tools (like EndNote), and cell-phone random digit dialing]. Coverage of reviewing the literature has also been expanded with an emphasis on current literature database searches, reference management software, and how to synthesize findings from a literature review. UPDATED: Quantitative research methods are updated to cover mediating variables, use of online surveys, and additional statistical methods such as intraclass correlation coefficients. A new example of performance assessment and step-by-step examples to calculate t-test and chi-square statistics are provided. UPDATED: Coverage of quantitative designs is expanded to include causal inferences in experimental designs and more detail about causal comparative research and single-subject designs. The authors provide examples of threats to validity in experimental research. The chapter on survey research is substantially updated to reflect the use of online surveys, methodological considerations, and sources for more information. 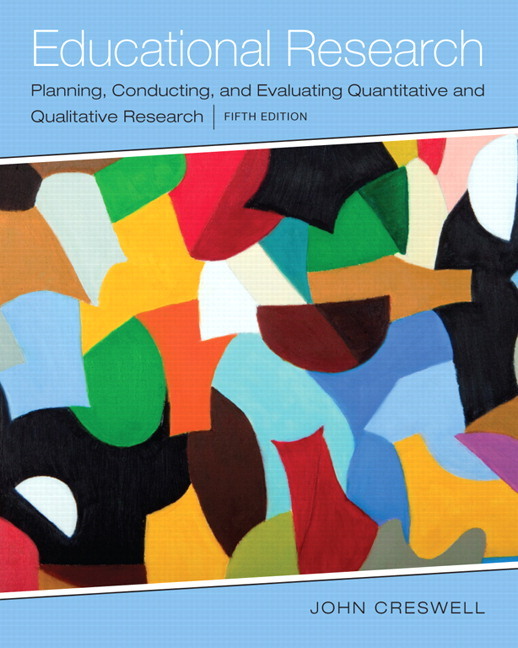 UPDATED: The chapters on qualitative research are updated, including coverage of qualitative data analysis software and recent developments in qualitative methods. 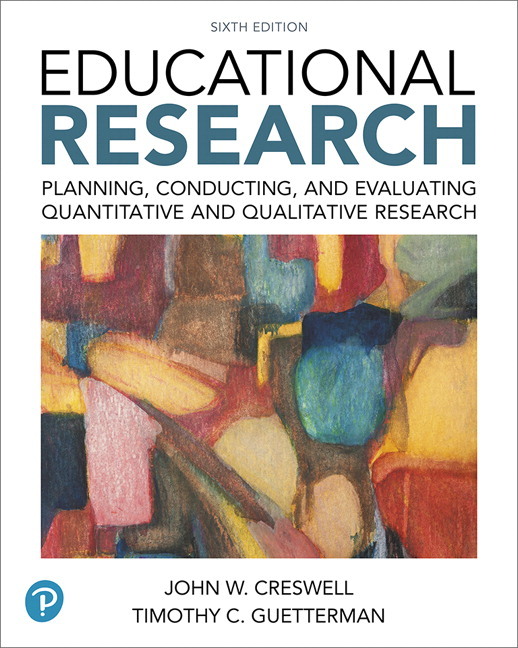 This edition includes a table comparing different approaches to grounded theory, new ethnographic study examples, and developments in narrative research. UPDATED: The mixed methods chapter is substantially updated to reflect methodological developments, in particular the discussion of integration of qualitative and quantitative data. The authors added recent examples of mixed methods research using convergent, explanatory sequential, exploratory sequential, and experimental mixed methods designs. Annotated research articles help students understand the structure of articles and the key issues to take into account when evaluating the quality and the applicable scope of each particular piece of research. Useful Information for Consumers of Research features offer tips on interpreting and evaluating research. Checklists summarize key points such as evaluation criteria used to assess the quality of a study. Useful Information for Producers of Research features present tips on planning and conducting research. Deliver trusted content: You deserve teaching materials that meet your own high standards for your course. That’s why we partner with highly respected authors to develop interactive content and course-specific resources that you can trust–and that keep your students engaged. Application Exercises challenge learners to reflect on and to apply what they have learned about educational research. Each scaffolded exercise either helps students learn how to read, understand, and evaluate research articles or offers opportunities to practice specific research tasks. Empower each learner: Each student learns at a different pace. Personalized learning pinpoints the precise areas where each student needs practice, giving all students the support they need–when and where they need it–to be successful. Multiple-choice Self-Check Assessments throughout the eText present students with opportunities to check their understanding. Each response provides immediate feedback that guides students’ learning and ensures they master key learning outcomes. Broadened examples beyond teacher education reflect the increasingly diverse disciplines and subdisciplines in educational research. The authors include examples of educational research in fields such as program evaluation, multicultural research, counseling, school psychology, learning and cognition, nutrition, sports psychology, education in the professions, and other fields. An expanded emphasize on technology [e.g., the use of online programs for a table of random numbers, use of online surveys, various databases available (like Google scholar or Web of Science), reference tools (like EndNote), and cell-phone random digit dialing]. Coverage of reviewing the literature has also been expanded with an emphasis on current literature database searches, reference management software, and how to synthesize findings from a literature review. Quantitative research methods are updated to cover mediating variables, use of online surveys, and additional statistical methods such as intraclass correlation coefficients. A new example of performance assessment and step-by-step examples to calculate t-test and chi-square statistics are provided. Coverage of quantitative designs is expanded to include causal inferences in experimental designs and more detail about causal comparative research and single-subject designs. The authors provide examples of threats to validity in experimental research. The chapter on survey research is substantially updated to reflect the use of online surveys, methodological considerations, and sources for more information. The chapters on qualitative research are updated, including coverage of qualitative data analysis software and recent developments in qualitative methods. This edition includes a table comparing different approaches to grounded theory, new ethnographic study examples, and developments in narrative research. The mixed methods chapter is substantially updated to reflect methodological developments, in particular the discussion of integration of qualitative and quantitative data. The authors added recent examples of mixed methods research using convergent, explanatory sequential, exploratory sequential, and experimental mixed methods designs.